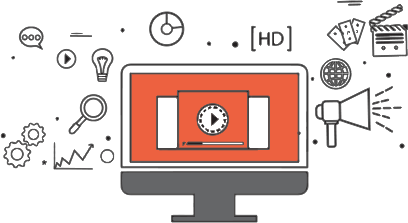 Animated explainer videos are a fun and easy-to-understand explanation of your product, service or idea. It allows you to engage with your customers visually. An explainer video can also be used to help your customers understand your product, service or idea and engage with your customers visually. The power of watching a good explainer video can stay with us long after we have finished watching it. Visuals also trigger an emotional response. For example, think of the movie or TV adverts that have the greatest impact on you; you might vividly remember a key scene or quote and even which character said it. Visuals generally stay with you far longer than text you have read and the brain has the amazing ability to remember visuals more easily. Explainer videos can also help your customers understand a complex product or service more easily. Explainer videos is that they have been shown to increase product conversion to a sale with 52% of consumers agreeing that an explainer video helps them feel more confident in their online purchase decisions. Research shows that 66% of people that watch a video will then go on to watch it 2 or 3 times. The simplest way to understand an explainer video is to imagine that you have to explain your product in less than 2 minutes. From script through to storyboard and delivery we make sure your explainer video is easy to understand for your customers, using our vast experience of knowing ‘what works’. One of the main benefits of explainer videos is that they have been shown to increase product conversion to a sale with 52% of consumers agree that an explainer video helps them feel more confident in their online purchase decisions. Research shows that 66% of people that watch a video will then go on to watch it 2 or 3 times. Your video should have a ‘call to action’ to help the customer take the next step. The simplest way to understand an explainer video is to imagine that you have to explain your product in less than 2 minutes. From script through to storyboard and delivery we make sure your explainer video is easy to understand for your customers by using our vast experience of knowing ‘what works’. It it easy to overlook the most important part at the end of your clip – your video should have a ‘call to action’. Help your customer take the next step in sales funnel and guide them on what step they should take next, whether this is signing up for a free trial, buying your product or service or perhaps subscribing to your newsletter for offers. We put so much time into getting the detail right for you that we recently did an explainer video for a customer and his son spotted one of his father’s staff in the animated explainer video as we drew his so accurately. We draw everything from scratch we have complete control of the features, clothes and shapes of your characters. Find out more now. All clients that we work with can rest assured that there are never any hidden costs. All changes and adjustments are included in the price and the price we agree is exactly the price you pay. It includes the script, voiceover artist, music, storyboarding and everything in between. Flexibility is our favourite choice of word when it comes to making changes. Some customers worry that making a change here or there will cause us a headache – quite the opposite. Let’s face it – most of our clients are not in this industry and we understand that and go to great lengths to encourage and help clients with their ideas during the creative process. We make drawing up your storyboards and the scriptwriting process easy, fun, creative and seamless with our our flexible working approach. If you are running to a tight deadline we can help. Very often, clients have an industry show or important meeting coming up in which they need to use their explainer video in for a presentation. Perhaps you need it urgently as your new website is going live imminently. We agree timescales with you from the start and work to your timeline for each part of the process. Our team is always on hand to run through any ideas, concerns or queries you have. We are totally flexible and no question about a storyboard, visual concept or idea is too large or small. We enjoy helping customers understand every aspect of the process and an assigned project Manager will be there every step of the way.